Previously, we learned about getting QuickBooks ready for time-tracking by activating it in Preferences. We also created a record for a service item. Now we’ll actually use that record in the two ways you’ll be using it in QuickBooks: to pay employees for their hourly work and to bill customers for services. 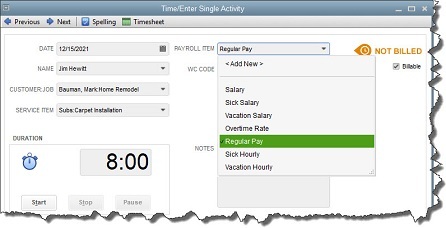 Once you’ve entered billable hours worked by an employee, simply open an invoice form and select that customer to open this window. If you are a business owner who is accustomed to treating clients to sporting events, golf getaways, concerts and the like, we have some bad news for you. The GOP’s tax-reform bill that President Trump signed on December 22nd of last year eliminated the business-related deduction for entertainment, amusement or recreation expenses, effective beginning in 2018. This doesn’t mean you can’t still entertain your clients; it just means you can no longer deduct 50% of the cost of that entertainment as a business expense, making it more costly for you to entertain clients. But all is not lost! The Act does retain a deduction for business meals that are directly related to or associated with the active conduct of your business. The term “directly related” means that actual business discussions were conducted during the meal and you anticipated a specific business benefit from the meal. The term “associated with” is more liberal and includes meals either preceding or following a bona fide business discussion. In either case, the business deduction continues to be 50% of the actual expense. Also remember that business meals must be documented, including the amount, business purpose, date, time, place and names of the guests as well as their business relationship with you. That’s not all! In the past, employers have been accustomed to deducting 100% of the cost of food and beverages provided to employees at or near the place of business. That too has changed, and the Act now subjects food and beverages supplied to employees to the 50% limitation. But that deduction is only allowed through 2025. As of 2026, employers’ costs for food and beverages furnished to employees will not be deductible. Meals while traveling out of town on business continue to be deductible and are also subject to the 50% limitation. If you have questions related to entertainment and meal expenses, please give us a call. If creating a start-up business were an easy thing to do, then a lot more people would be doing it. For those who make the decision to fulfill their dreams and go for it, success relies on being fully prepared. Some of the most common stressors encountered by entrepreneurs involve tax liabilities, whether business is booming or they’re struggling to keep their head above water. The best way to avoid these pitfalls is to learn about them ahead of time. Here’s what every entrepreneur needs to know. The entity that you choose for your start-up will have a big impact on how your taxes are handled, so make sure you’ve done your research to find the option that works best for your specific situation. Factors like the state where you’re doing business and the type of business you’re operating will be a consideration, and so will your ownership profile. Businesses that don’t plan on adding partners or shareholders in the future or that anticipate changing owners in the near future are probably limited to establishing as a C corporation or an S corporation, with the former offering more flexibility on ownership shifts, as well as the possibility of international investors. Though there’s no law to prevent you from shifting to another type of entity in the future, doing so can be disruptive, so it makes sense to take your time and choose the option that fits best and makes the most sense based on your current ownership plans. Unless you’re an accountant or have experience and significant knowledge of accounting, it’s a good idea to sit down with a professional to determine whether you’re going to use a cash accounting method, an accrual method, or a hybrid of the two. If you don’t have a background in bookkeeping and taxes, it may seem like an academic question, but it plays a big part in determining your tax liability. A lot of the determination will also depend on the type of business you run. An experienced accountant will be able to walk you through the decision that makes the most sense and that will be easiest to implement in compliance with IRS regulations. As a start-up, there are certain internal controls you need to put in place to ensure that your business is running smoothly and according to your stated objectives and goals. You also want to be sure that you’re set up to provide comprehensive information for external investors. Company policies need to be written and communicated with an eye to regulations. A CPA will be invaluable in helping you get these controls in place. Every entrepreneur likes to do things their own way, but there are some issues where compliance is key. Failure to follow the rules and regulations could lead to stiff penalties and fines, or even to your business either temporarily or permanently being shut down. In addition to paying taxes on your business’s income, you also need to find out whether your locale requires a business license and what the rules are if you’re selling either a digital or physical product over state lines. Sales tax will need to be paid, workers’ compensation insurance will need to be purchased and a policy put in place if you have even a single employee, and if you’ve organized yourself as a Delaware corporation, then you’ll need to have an annual franchise tax report prepared, filed and paid, whether you generate income or not. One of the biggest mistakes new business owners make is failing to create a budget and stick to it. Failure to do so can easily lead to a shortfall in available funds, including those you need to pay your tax liability. Take the time to make a reasonable budget and establish what your start-up’s key performance indicators (KPIs) are for both cutting expenses and generating income. With those issues addressed, you give yourself a solid way to measure how you’re doing, and you’re likely to find both short-term and long-term tax planning easier too. Starting a new business is a dream come true for many, but your focus has to go beyond your own area of expertise and interest. By working with a tax professional, you can be sure that you’ve addressed the tax-related problems that have tripped up many start-up organizations. Please call us with any questions related to creating a start-up business. If you have questions related to the loss of this deduction or about how the change will impact your specific tax situation, please call us. If you have been or are anticipating converting your traditional IRA to a Roth IRA, you should be aware of a tax trap that Congress built into the Act. Traditional IRA – Is a retirement plan that generally provides a taxpayer with a tax deduction when a contribution is made to the account. Then when distributions are taken from the account they are fully taxable, including earnings. Roth IRA – Is also a retirement plan, but unlike the traditional IRA, a Roth IRA does not provide a tax deduction for the contribution. Thus, once a taxpayer reaches retirement age, all of the distributions are totally tax-free. The big benefit here is that all the Roth account earnings over the years end up being tax-free as opposed to those from the traditional IRA, which are taxable. For that reason, many taxpayers take advantage of a provision in the law that allows them to convert a traditional IRA to a Roth IRA. However, for the year that a traditional IRA is converted to a Roth IRA, the converted amounts are taxable. Therefore, most IRA owners carefully plan the amount and timing of the conversions to be done in a year when they are in lower-than-normal tax brackets. Prior law included a provision that allowed taxpayers to change their minds and undo a conversion by recharacterizing the Roth converted amounts back to traditional IRAs and thus also undoing the tax liability. This was helpful for those who had underestimated the tax liability, did not have money available to pay the tax, saw the value of the converted IRA drop (which would mean they’d be paying tax on a phantom value) or just changed their mind. Unfortunately, the Act pulled the plug on recharacterizations, and beginning in 2018, taxpayers can no longer undo a conversion. Once a conversion is made, the IRA owner will have to live with the tax consequences. This rule applies for conversions from a traditional IRA, SEP or SIMPLE to a Roth IRA. The new law also prohibits recharacterizing amounts rolled over to a Roth IRA from other retirement plans, such as 401(k) or 403(b) plans. However, for taxpayers who made a conversion to a Roth IRA in 2017, the IRS has announced the conversion may be recharacterized as a contribution to a traditional IRA if the recharacterization is made by October 15, 2018. A Roth IRA conversion made on or after January 1, 2018, cannot be recharacterized. Recharacterization is still permitted with respect to other contributions. For example, an individual may make a contribution to a Roth IRA for a particular year and, before the due date for their income tax return for that year, recharacterize it as a contribution to a traditional IRA or vice versa. If you have questions related to converting a traditional IRA to a Roth IRA, please give this office a call. If you would like to strategize on how to minimize the tax on a conversion, please contact us. As part of the Act, Congress changed the tax-rate structure for C-corporations to a flat rate of 21% instead of the former graduated rates that topped out at 35%. Needing a way to equalize the rate reduction for all taxpayers with business income, Congress came up with a new deduction for businesses that are not organized as C-corporations. As a result, the Act has provided a new and substantial tax benefit for most non-C- corporation business owners in the form of a deduction that is equal to 20% of their qualified business income (QBI). This deduction is most commonly known as a pass-through income deduction because it applies to income from pass-through business entities such as partnerships and S-corporations. This category also includes income from sole proprietorships, rentals, and farms; Real Estate Investment Trust (REIT) dividends; pass-through income from publicly traded partnerships; and cooperative dividends. The shorthand term for this deduction is the Sec 199A deduction, as 199A is the Internal Revenue Code section number for this provision. Let’s look at how this deduction works. Guaranteed payments from a partnership. The pass-through deduction is not a business deduction, as it is deducted after a taxpayer’s adjusted gross income. It can be claimed regardless of whether the taxpayer claims the standard deduction or itemizes deductions. Since it is not a business deduction, it does not affect the computation of self-employment tax. Where QBI is less than zero, it is treated as a loss from a qualified business on the next year’s taxes. Complicated Computation – Congress ignored simplification for this deduction, which is quite complicated and which includes limitations at the entity level and for the combined deductions from all entities; furthermore, it is subject to a limitation based on taxable income. Threshold – When determining the 20% of QBI deduction for each entity, the deductible amount may be reduced, phased-out or phased-in based on that year’s taxable income (without regard to the deduction itself). The thresholds for each limitation are $157,500 for individuals and $315,000 for joint filers. The maximum of any phase-out or phase-in is $50,000 more than the threshold for individuals and $100,000 more for joint filers, so the maximums are $207,500 for individuals and $415,000 for joint filers. Specified Service Business – Special rules apply to specified service businesses, which are generally businesses that rely on the skill and reputation of the owners or employees. These include businesses focusing on health, law, accounting, actuarial science, performing arts, consulting, athletics, financial services, brokerage services, and so on. This category specifically does not include engineering or architecture businesses and trades or businesses whose services consist of investment-type activities. For specified service businesses, if the taxable income is equal to or below the threshold, the entity’s deductible amount is the full 20% of QBI. When the taxable income is above the threshold, the deduction is pro rata phased out between the threshold and the cap. Thus, a specified service business entity has no deduction when the taxable income exceeds $207,500 for individuals or $415,000 for joint filers. 25% of the W-2 wages from the business plus 2.5% of the unadjusted basis of the business’s qualified property. Taxable income exceeding the cap ($207,500 for individuals or $415,000 for joint filers). Income below the threshold – The entity’s deductible amount is the full 20% of QBI. Income above the threshold but less than the cap – This is the most complicated computation because the wage limit is phased-in between the threshold and the cap; it only applies to a pro rata portion of the deduction. Income above the cap – The deduction is equal to the lesser of the wage limit or 25% of QBI. Example: A single taxpayer has a taxable income of $125,000. He runs a small car-repair business that has a net profit (QBI) of $100,000. Because his taxable income is below the threshold, his deduction for the business entity is $20,000 (20% of $100,000). Example: A married taxpayer with a taxable income of $500,000 is a shareholder in an S-corporation. The K-1 from the S-corporation shows pass-through income (QBI) of $300,000. The pro rata share of that taxpayer’s wages that were paid by the corporation is $100,000, and the pro rata share of the taxpayer’s qualified business property is $75,000. Because the taxable income is above the cap, the deduction for this business entity is the lesser of the wage limitation or 20% of the QBI. The wage limitation is the greater of $50,000 (50% of the $100,000 in wages) or $26,875 (25% of the $100,000 in wages plus 2.5% of the $75,000 in qualified business property). Thus, the wage limitation is $50,000. This is less than $60,000 (20% of the $300,000 in QBI), so the taxpayer’s deduction for this business is limited to $50,000. Aggregating Amounts – Once the deductions have been determined for each of a taxpayer’s business entities, they are combined in a rather complicated computation. First, the total deduction is added to 20% of the taxpayer’s REIT dividends and all of the taxpayer’s publicly traded partnership income and cooperative dividends (after limitations). The final step is to compare this combined deduction amount to the taxpayer’s adjusted taxable income (i.e., taxable income minus capital gains); the lesser of the two becomes the actual deductible amount. As you can see, this deduction provides a great tax benefit for business owners, but it can be quite complicated. Please contact us with any questions.